Pre-Internet, the International AIRWOLF Appreciation Association was the oldest and largest organisation dedicated to keeping the international fans in touch with the high-flying world of AIRWOLF. Based in Northern Ireland (one part of the United Kingdom of England, Scotland, Wales + Northern Ireland), it was created over 15 years ago in 1988 by Mark J.Cairns, then Head of the International Appreciation Association, and sported members ("The Wolf Pack", a collective term coined originally by Mark J. Cairns in 1988 for Airwolf fandom) in 20 countries worldwide. The Wolf Pack kept in touch through their professionally-produced ‘File A56-7W’ magazines. 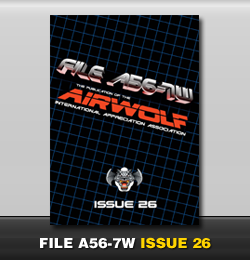 The very last info-packed issue of the now rare and critically acclaimed 'File A56-7W' publication from the International Airwolf Appreciation Association was bigger and better than ever before... being professionally printed for the first time in its ten year history. A fitting way to finish. Mark J.Cairns gave up editing the magazines, and closed the Airwolf Appreciation Association to concentrate on creating the original 'Airwolf Themes' 2CD: Special Limited Edition. 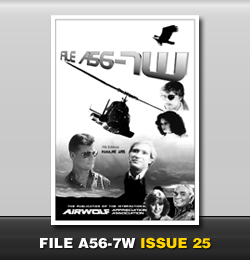 Lovingly produced, it contained a wide variety of interesting, never-before-seen articles and photos, most of which have never made it to any Airwolf website or the web at large. 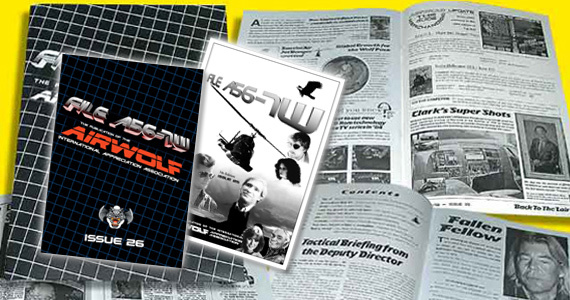 A must-have piece of Airwolf history for any fan of the high-flying 1980s TV series! "AIRMAIL" -- Wolf Pack letters and views before Forums and Facebook! Air Show Pictorial No.2 -- more photos from the largest Airshow in Europe at RAF Mildenhall in Suffolk, England: including the F-117 Stealth and the Russian Mil-24 Hind Helicopter Display Team, as well as a surprise of two!